Easter is the most important holiday for all the Christians. This festival is celebrated around the world in an amazing diversity of ways, with customs differing from the country to the country, conforming to their national and cultural origins. The majority of Lithuanians are Roman Catholics, so Easter is the most important date in their sacred calendar as well. And, surely, there are some special Easter traditions in Lithuania. To begin with, Easter rituals start with The Great Lent, called Gavėnia in Lithuanian, which precedes holiday and lasts for 40 days. Then the Palm Sunday (Verbų Sekmadienis), which falls on the Sunday before Easter, begins the Holy Week. One the of main unique Lithuanian traditions you can see just in these days. The Palm Sunday commemorates Jesus Christ’s entry into Jerusalem. The crowds of people welcomed Jesus, when he entered the city. Celebrating people laid down their cloaks, and small branches of trees in front of him according to Christian faith. Therefore, nowadays many Churches are adorned with the Palm branches this Sunday. However, there are no Palms in Lithuania due to the harsh climate. Much time ago, someone came up to make decorative palms instead of natural. 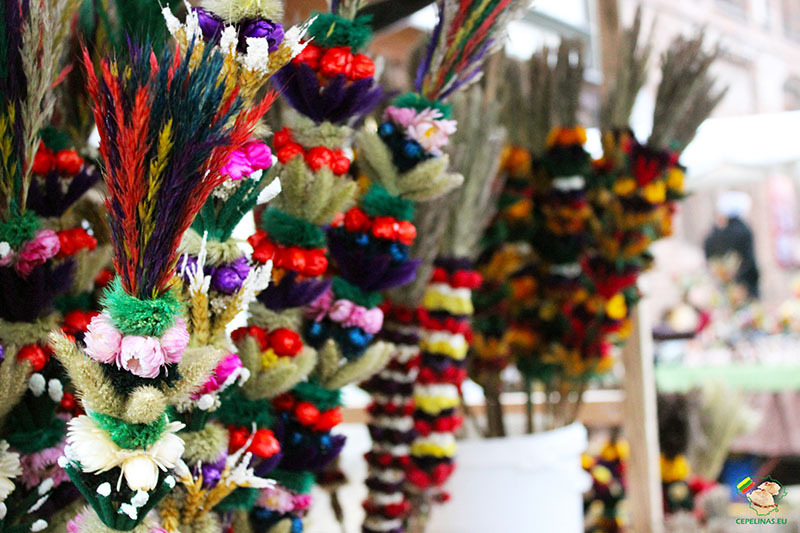 Such unique local “Palms”, which nowadays are called Easter Palms or Verbos in Lithuanian, are made of the different dried colorful flowers, the cereal stems and ears, the willow branches. The Verbos are one of the most famous region’s specialties. Then, on the Holy Thursday (Didysis Ketvirtadienis), according to the custom, people clean houses, wash windows and clothes. In old times, spinners used to hind spinning wheels and spindles because should they be seen by anyone, the spinner would have great difficulty with her work during the coming year. Later on, during the Holy Friday (Didysis Penktadienis), people try to be quiet, children could be forbidden to make noise in respect for Jesus, who was crucified this day. On the Holy Saturday, people prepare for the Easter Sunday celebration. 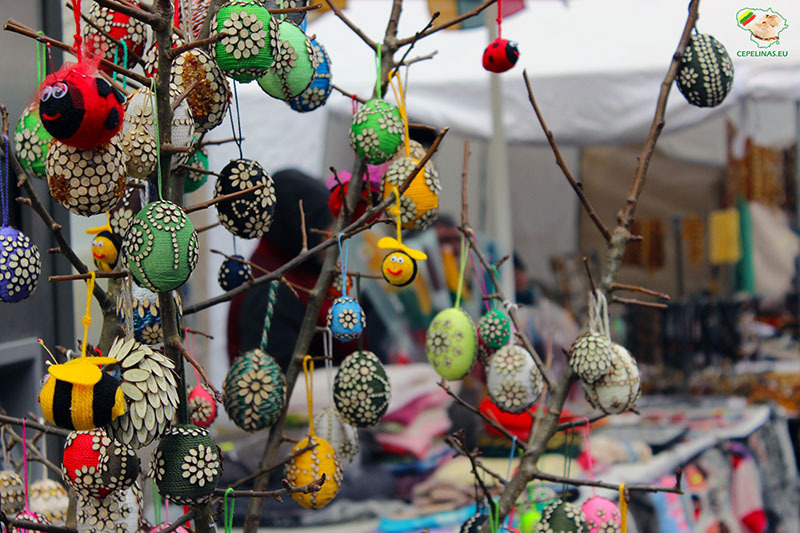 Exactly on this day the famous “Margučiai”, painted eggs, are made. Margučiai are decorated in a variety of the ways. The simplest method is to stain eggs with the natural dyes, which are near at hand like flower petals, hay, beets, onion skins, other different fruits and vegetables. Also, there are and more sophisticated techniques, like hand painting or scratch-carve method. Experienced master can paint or scratch with the needles intricate ornaments and paintings. People in the countryside, even in recent times, believed that decorations added mystical powers to the egg. According to the superstition, such egg protects his holder from the disasters and brings luck. On the Easter morning, people go to Easter Mass and then have a lavish festival meal at home. The dinner starts with blessed egg, salt, communion wafer, which are shared by all the family as a sign of the cohesion. After the Easter Mass there are no food prohibitions, so on the festival table can traditionally be roasted pork and chicken, ham and bacon, other meat which is accompanied with the potatoes, mushroom and different home-made salads. 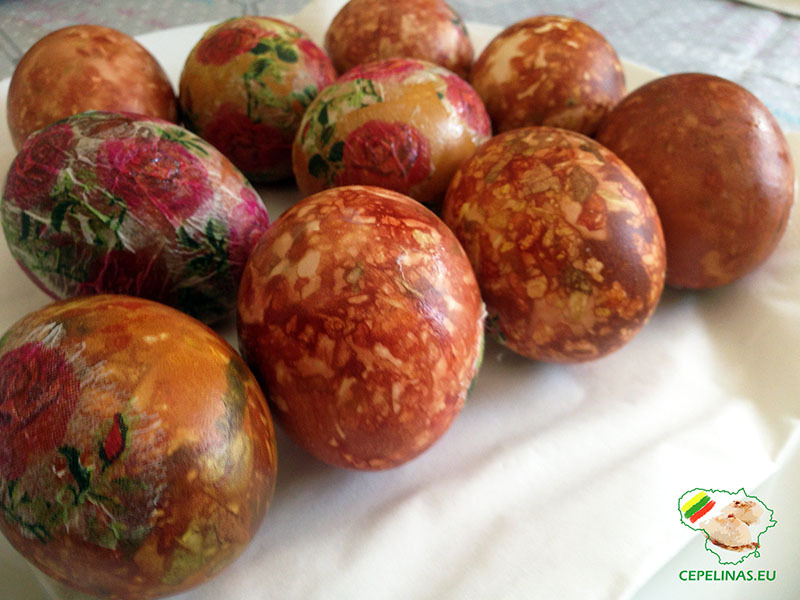 The last and the funniest Lithuanian Easter tradition is “clinking” with the painted eggs. Each person takes Margutis and clink it against another’s. It is believed, that the person, whose egg remains unbeaten would have a long life. Wish you strong Margučiai, long life and nice Easter holiday! Velykiniai marginėjimai / Speckle Easter Eggs from aliora on Vimeo.